Hardwood is no exception to the high standards we hold for all of our flooring here at Washington’s Carpet One Floor & Home. Hardwood flooring is a luxurious and durable product. We know hardwood flooring is an investment into your home, which is why we help guide you in the right direction. Buying a hardwood floor is not a one-size-fits-all decision, and our flooring experts are right here to help you every step of the way. Our selection of hardwood flooring covers a wide range of styles and trends. When it comes to choosing a hardwood floor for your home there are many different factors to consider such as your lifestyle, how much traffic your home sees, your cleaning routine, where you want to install hardwood, and what type of hardwood you want. You don’t have to make all of these decisions on your own, that is what our flooring professionals are for at our Mansfield showroom! 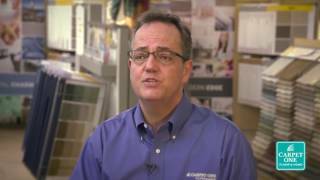 Join our very own Jim Aaron, VP of Merchandising for Carpet One Floor & Home, for some information on all the different looks and style available in hardwood floors. Choose from solid or engineered hardwood, exotic or traditional, even choose the color and plank width. You can make hardwood flooring custom to your home that fits your lifestyle and personal style. Stick with the trends that are popular today like hand scraped or rustic, or stick with traditional warm wooden uniform looks. Not all hardwood is made from the same materials, which is why you see so many different styles to choose from. The different hardwood options include maple, cherry, hickory and oak among others. Each wood option offers unique shades and character, and they also feature different strength levels and wear resistance. Solid hardwood is somewhat considered the original hardwood option, and is made from a solid piece of lumber. These planks can range in width and height, but are typically ¾” thick. Solid planks can be sanded or refinished depending on the level of damage to the surface as well as the bevel. Engineered hardwood is made from multiple wood layers which provide the planks with more stability compared to solid planks. These planks have the ability to resist wood’s natural tendency to expand and contract due to changes in moisture. They also come in the same species as solid hardwood does, so you do not have to sacrifice style for functionality. Where Can Hardwood Be Installed? Hardwood flooring is meant to be installed in on or above grade rooms such as living rooms and bedrooms. You can install hardwood floors in kitchens as well, but you must clean up spills right away in addition to regular maintenance. Remember, hardwood flooring is not a waterproof option and can become warped when exposed to water or moisture for too long. We offer only top quality hardwood brands in the industry. And, we offer premium services such as hardwood installation. We have styles of solid and hardwood flooring, so be sure to visit us to shop our selection. Since we are part of the Carpet One Floor & Home cooperative, we offer exclusive brands such as Rustic River™, Invincible™ Hardwood, and Voyager™. Continue reading below to learn more about hardwood floors we carry, and make sure you stop by our Washington's Carpet One Floor & Home showroom in Mansfield, OH and speak with one of our flooring experts. Rustic River emphasizes wood's natural character. Invincible Hardwood offers premium durability. Voyager offers bamboo and cork flooring. There are many reasons why hardwood is such a popular choice. Let us give you a few more reasons as to why hardwood would be best for you. What Type of Hardwood is Best? We are asked often what the difference between solid and engineered hardwood is. Here is a quick explanation of the major differences.